July 17, 2018 – Hot tub soaking is such a terrific activity. It’s been proven over time through a myriad of studies that it’s one of those natural “wonder drugs” to keep you healthy and happy. There’s a very good reason that most people sink into the water in their tub up to their neck and utter a monosyllabic “Aaahh”. One thing that could turn that “Aaahh” into an “Eeeww”, however, is water suffering from a lack of good filtration. What you do to keep your water clean and safe is largely due to how you manage the upkeep of your hot tub’s filtration system. Here are a few ways you can make sure you’re setting your hot tub’s filtration up for success. If your tub has an ozone system, has it been cleaned? Or does it need replacing? This is easy to forget about since your ozone system lives inside the equipment bay of your hot tub. An ozone system successfully injecting a good mix of ozone into your tub’s water helps oxidize contaminants immensely. In a Hot Spring Spa, it’s best to clean the ozone injector once a year with white vinegar. It’s fairly easy to do, but if you’re one of our customers and would prefer we clean it for you, we have that service available. Ozone systems generally have a life span of about 3-4 years. If it’s beyond that time frame for yours, it may be time for a replacement ozone system. If you use aromatherapy, be sure it won’t clog filters. We love aromatherapy for the tub! At Olympic, we’ve a long history of folks using additives to enhance soaking. We sell a full array of scents from Spazazz Aromatherapy. 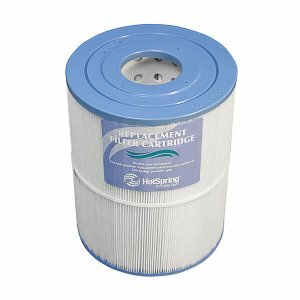 This line is thoughtfully formulated so it will not clog your filters or hinder your tub’s filtration in any way. Give yourself a hot tub filtration test on the four topics above! If you pass, bravo to you! If not, take the steps necessary to get your hot tub back to filtration freedom.